Will your class find the missing Easter Bunny before Easter? Need a fun and exciting activity to do with your class? 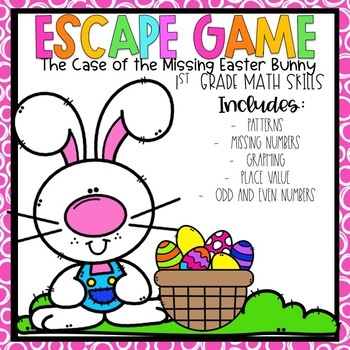 This Easter Escape Room game is focused on all 1st grade math skills. Students will practice their facts while having fun. There are five tasks. You can do all five tasks, or do as few as you want. There are step by step directions and examples to show you how to set up and prepare for your class. This activity can be used as whole group or groups.